Taken from 'The Book of Assistance' chapter 14 'On following the Sunna' by great Qutb Imam Haddad. The last section is about not drinking from vessels that were NOT covered over night as a sicknesses descends one a night that is hard to recover from its part of my notes on Shifa and wellbeing. ..Shut the waterskin's mouth, cover all vessels, and shut the house's door, especially before going to sleep or going out. Do not go to sleep until you have put out. Do not go to sleep until you have put out or covered all flames in the house such as lamps, and so forth. 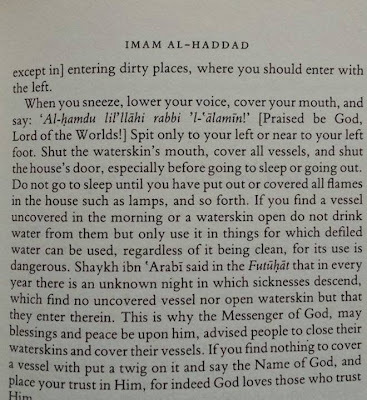 If you find a vessel uncovered in the morning or a waterskin open do not drink water from but only use it in things or which defiled water can be used, regardless of it being clean, for its use is dangerous. Shaykh 'ibn 'Arabi said in the Futuhat that in every year there is an is an unknown night in which sicknesses descend, which find no uncovered vessel nor open waterskin but that they enter therein. 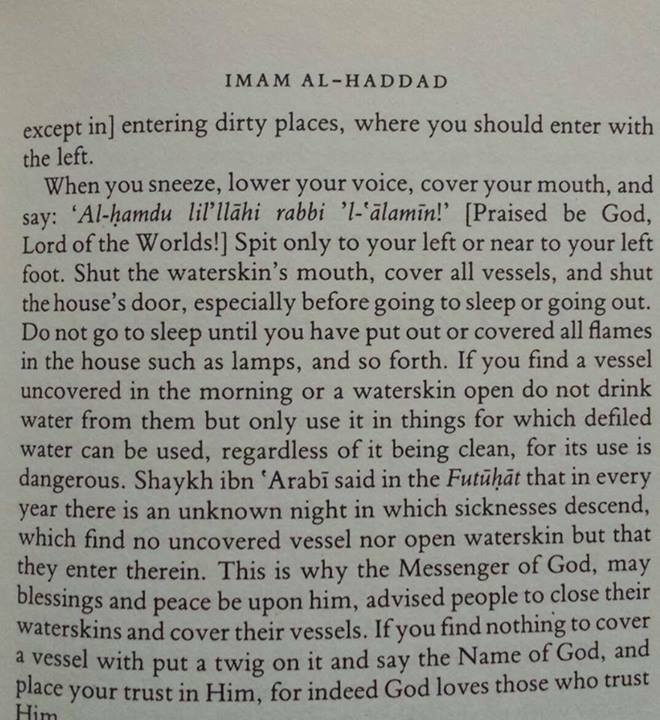 This is why the Messenger of God, may blessings and peace be upon him, advised people to close their waterskins and cover their vessels. If you find nothing to cover a vessel with put a twig on it and say the Name of God, (Bismillah) and place your trust in Him, for indeed God loves those who trust him. Click pic below to read more this is only a section of the chapter on following the Sunnnah by Imam Haddad. As for shutting doors and windows Jinns and evil shaytans can enter they cant open closed doors and windows. As for blowing our flames Jinns or Evil shaytans can blow or pull on a naked flame and cause fires in ones house. Interesting in the islamic book of 'medicine of healing' they say that it happens in the January but Allah knows best.